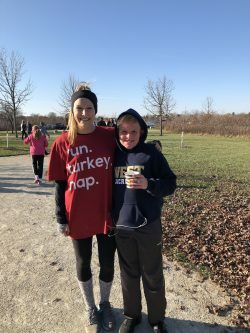 Last week when we traveled to Illinois for Thanksgiving, my daughter and her sister wore matching shirts for a Thanksgiving morning 5-K. What looked like a small town athletic event was run by the church with grand purpose. Tickets for the race were purchased by donating a toy. The huge collection of items for needy children will then stock the shelves this month for Giftmart. Qualified parents can come shopping for their children in this “store” for $2 per toy. It’s a BRILLIANT service project for the community. I can only hope other churches would do the same. But something else was BRILLIANT on race day. 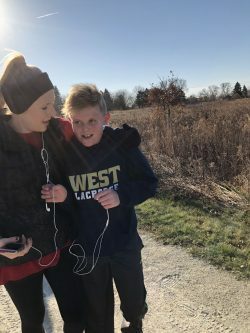 As I looked at photos of the morning from her phone, I pieced together that my daughter had been brilliant with her brother. 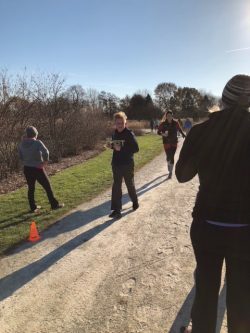 He had never run a 5-K before. She ran it with him until he crossed the finish line. It doesn’t sound like much, does it? Let me add some detail. My daughter is a serious athlete who played sports through college. She could have run that 5-K backwards and crossed the finish line in first place without even breathing hard. That would have been fun and easy. Her greater purpose, however, was to see her brother cross the finish line. With intention, she set herself aside and ran alongside him. And when the finish line was in sight, she let him cross first. It means to intentionally choose to run alongside someone, encouraging them, and letting them experience the thrill of seeing Jesus do things through them for the first time. Making the relationship about them, not you. Making their personal progress the priority, not yours. Making their list of accomplishments for God’s kingdom longer than yours. Discipleship looks like what my daughter did last week with her brother. I can’t get it off my mind. I keep asking myself, who am I running alongside? Who is getting my attention? Who am I helping to grow spiritually? Who am I helping to accomplish spiritual things for the first time? In short, who am I discipling? I think every Christian, except during some seasons of life, should be able to answer these questions with specific names, and if we can’t, it’s an issue to take up with the Lord. Saying the names of our children does not count. Every parent is to disciple their children, that is a given; and we don’t need to leave our house to disciple them. We need to GO out the front door to somewhere outside, even if it begins with the neighbor next door. Here is another tidbit about my daughter’s fabulous church in Illinois. 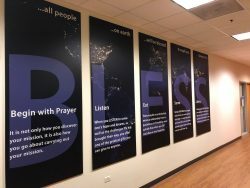 In their lobby, they have placards describing the purposeful progression of relationships for the glory of God. B – Begin with prayer. L – Listen to their story. E – Eat and share a meal together. S – Serve them somehow. S – Share your story with them, complete with an open discussion about your relationship with God. It’s time to start wrapping up 2017 and start looking ahead to 2018. Would you join me in asking God to give us people to disciple? It is our job. It is our purpose. It’s the way the church can bless the earth. Picture Explanation: The people who inspired me last week. It goes both ways, my friend. Both ways. This blog makes me smile 🙂 I love you Mom!